Hot off the recent news of Sony having sold 3 million PlayStation VR headsets to date, First Contact Entertainment has released Firewall Zero Hour. There are a lot of expectations for this tactical, squad-based virtual reality shooter, but does it live up to the hype? Find out in our review now. The best VR games fade into the background, presenting the player with all the information they need to know in-world. Firewall Zero Hour is a terrific example of this. There is no heads-up display to be found. Ammunition counts are found on a holographic display in front of each weapon’s sights. So to check, you need to physically hold your gun up, and glance down at the display. The same goes for looking at a map of the area—each player is equipped with a wrist tablet, which shows where friendly players are, as well as most enemy players if they are making noise at the moment. Progress towards the goal, as well as time remaining, is also shown here. This aspect of Firewall Zero Hour takes some getting used to, and also represents more risk than might be normally attributed to something as simple as checking on a map might entail, since glancing down at your wrist takes your eyes considerable further from potential enemies than a quick glance at a static map in a corner of the screen as is the case for traditional, non-VR shooters. Firewall Zero Hour launches with essentially one game mode, Contracts, wherein a group of attackers attempt to place a device to bypass a firewall, which is used to pinpoint the location of a laptop which must be hacked in order to win the game. The defending team simply has to either run out the clock (all rounds are five minutes) or kill all of the opposition. There is also a tutorial, which tasks the player with completing a small subset of the available game actions, which is over in only a couple of minutes at most. A training mode is additionally available, which can be played solo or in public and/or private matches. The training mode pits one to four players against a stream of AI enemies, so it is essentially a bot-filled version of Contracts mode. Contracts mode pays out the most in terms of XP and Crypto, Firewall’s in-game currency, a design decision purposefully made by First Contact Entertainment in an effort to drive a large portion of the player-base to that mode. Tactical shooters tend towards the more realistic side of games, and Firewall Zero Hour certainly fits that description. Weapons have limited ammunition, and it only takes a few hits to down a player. If downed by gunfire (and not a headshot or explosion), teammates can revive a downed player—if the person who downed them doesn’t outright eliminate them in that downed state first! Once a player is killed (or downed three times in one game), that’s all for them—one life per match. However, players who are dead can feed information to their teammates via voice chat, as they gain control of cameras placed at strategic spots throughout the map. This kind of feels like cheating, but it does give dead players a reason to stick around until the end beyond just collecting their XP. Plus, since both teams have this ability, it’s about as fair as could be. As with most tactical shooters, Firewall Zero Hour is best played with cooperative teammates. Since the PSVR headset includes a microphone built into it, most players use it. An effective team sticks together, feeding each other information about where enemies are spotted, or the tactics to use to attack or defend the location. Firewall is designed to foster cooperation. For instance, a player’s voice fades with distance, so the closer someone is to their teammates, the more informed they will be. If playing in a public match with random players, invites can easily be sent to players encountered to squad up later. In the lobby, the current contractor and loadout of each squad member can be seen, while player level is left out, perhaps intentionally so that new players don’t necessarily scare off the more seasoned players. Surprisingly, Firewall Zero Hour is serviceably playable with only a DualShock 4 controller (the headset is, of course, required). Aiming feels a little awkward, as you must hold the controller such that the light bar faces the camera, but it works in a pinch. Obviously, the ideal setup involves using the Aim Controller. This accessory features all the functionality of a DualShock 4, including rumble, all in the shape of a lightweight rifle. Aiming with this gun feels much more natural than using a regular controller, and multiple actions can be performed without taking your trigger finger off from where it needs to be. Tracking is as reliable as your setup allows—if you’re in a small room where you cannot get approximately two meters/six feet away from the camera, then it may not track as well, causing unpredictable in-game behavior. Standing for such an involved game is also a must, since sitting does not afford as wide a range of motion as standing does. Leaning around corners feels natural, and can offer aiming opportunities that many people are not used to in a shooter. 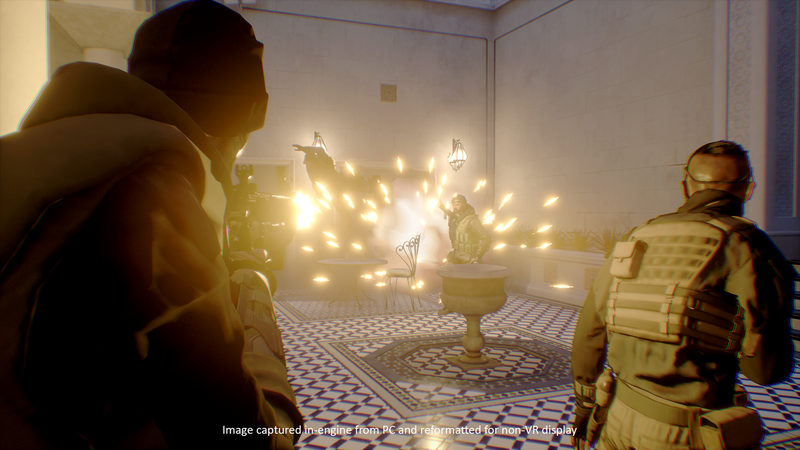 Graphically, Firewall Zero Hour isn’t the best-looking shooter you’ll find. But it doesn’t have to be. VR is an immersive format, which most people’s brains are geared to accepting as reality in short order. When engaging in a firefight, or rushing as the last surviving member of a squad to secure data, most players will find their heartbeats rapidly climbing as the intensity of the situation mounts. What’s more important than character models or polygon count on the environment is the frame rate. Thankfully, this stays high no matter how many bullets are whizzing past, smoke grenades are thrown, or general chaos is created whenever up to eight combatants are exchanging blows. You won’t notice that the soda can on a nearby desk has a fuzzy look to it, because it doesn’t matter in this context. All you know is that the enemy is around the corner, and you have your trusty rifle trained on the hallway in front of you, ready to strike. Variety can help to ensure that things stay fresh in any game. Firewall Zero Hour ships with nine maps at launch, three in each location (UK, Middle East, and Russia). While this isn’t a ton of maps, the locations of objectives does change in each playthrough, which has a couple of benefits. This ensures that the map won’t be so quick to feel stale, and it may also help players become more familiar with each map. Considering that the approach taken in each map also changes based on if players are attacking or defending the laptop, there are a lot of variables at play to keep things different each time. Speaking of variety, there are twelve different contractors, or characters, to choose from. The majority of the contractors are available from the start, while the last remaining four are unlocked as the player reaches certain levels. Each contractor has a specific unique ability, such as “Red” who carries an extra frag grenade into each round. Unlocking an attachment for a weapon thankfully unlocks it across characters, so there is no need to grind out for the same thing multiple times. Having said that, unlocking items is still a considerable grind. While winning a round will net upwards of 1,000 XP, losing will only bank a few hundred at best. So getting into a losing streak will make unlocks feel like they are a long ways off. 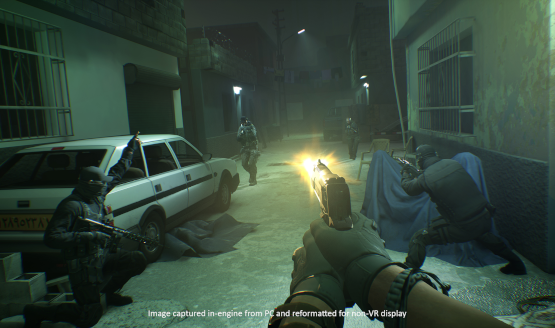 Firewall Zero Hour shows the potential for the world of VR games. It makes a solid case for the Aim Controller, which will hopefully see continued support from not only Sony, but other publishers as well. While there is a steep grind to unlock all of the tactically useful items, those who manage to tough it out will be rewarded with a more satisfying experience. Firewall Zero Hour is an intense, immersive experience which will put the Aim Controller through its paces, and may be the best VR shooter released thus far. Firewall Zero Hour review code provided by publisher. Version 1.02 reviewed on a PS4 Pro. For more information on scoring please see our Review Policy here.